"Aïr" redirects here. For the state of Aïr which formerly governed this region, see Sultanate of Agadez. Desert near Agadez, with the Aïr Mountains in the distance. Note the volcanic outcrops, common to the Aïr. The Precambrian to Cenozoic Aïr Mountains consist of peralkaline granite intrusions which appear dark in colour (unusual since most granitic masses are light-toned in the field). In the Sahara Desert such mountains often stand out in stark relief as topographic heights amidst lowlands covered by sand. The terrain consists of high plateau, mountain ranges, and broad, sandy valleys and seasonal wadis which once contained rivers. Areas of these deep, often intersecting, valleys also contain waterborne clay and silt deposits. Underground watercourses in some of these valleys continue to provide year-round oasis and seasonal vegetation. Circular granite massifs (dark areas). A volcanic crater can be seen at the lower left. NASA image approximately 130 km (81 mi) across. The Aïr mountains themselves consist of nine almost circular massifs rising from a rocky plateau, bordered by the sand dunes and plain of the Ténéré Desert to the east. The massif is a plateau consisting of a sub-Cambrian age erosion surface on Precambrian metamorphic rocks, punctuated by a series of flat-topped, granite intrusion peaks, which include Mont Idoukal-n-Taghès (Niger's highest point at 2022 m), Mont Tamgak (1988 m), Mont Greboun (1944 m), Adrar Bous, Fadei, Chirriet, Taghmert, Agueraguer, Takaloukouzet, and Goundai. The massif contains volcanic features including the extinct caldera of Arakao, Cenozoic lava flows of hawaiite to trachyte composition, volcanic cones, tuff rings and one of the largest ring dike systems in the world. At Izouzaoenehe, lie the marble Blue Mountains, and the lower Zagado valley is surrounded by white marble hills. Carboniferous sandstone and coal units in the Iullemmeden Basin just to the west of the massif contain uranium mineralisation sourced from the granites of the massif. The Guelta near the town of Timia in central Aïr provides year-round water in an otherwise dry region. 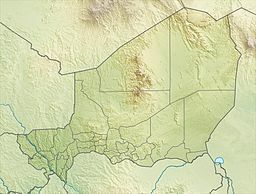 Because of its altitude (on average between 500 and 900 m) and despite its low rainfall (50 to 160 mm/year on the lower plateau), the Aïr forms a green region in comparison with the surrounding deserts, especially after the August–September seasonal rains. The climate is classified as Sahel, like that of the regions well to its south. While the mountains are largely bare of vegetation, the dry wadi river valleys (known by the Hausa term "Kori") channel and hold rainwater in gueltas (stone pools, such as that near the town of Timia), creating oases which provide forage for animals, and in some areas, farming. The high Bagzane plateau of the central Aïr in particular provides adequate rainfall for intensive agriculture. Other, vast, areas of the region are entirely devoid of plant life and with their volcanic protrusions and rock fields present an otherworldly appearance. More than 430 vascular species has been recorded so far in the Aïr mountains. The location of the Aïr as a southern extension of the Hoggar mountain range makes it a connection between the Saharan Flora and the Sahelian Flora. However, the presence of mountains up to 2000 m a.s.l. generates locally favourable conditions for several species of the Sudanian zone and the Mediterranean zone. During the 20th century a series of scientific missions in the Aïr has permitted to identify the majority of plant species developing in the Aïr. Acacia tortilis subsp. raddiana (Afagag) and Balanites aegyptiaca (Aborak) are among the most frequent tree species in the intermountain zone. In the vicinity of temporary rivers named koris, species like Acacia nilotica, Faidherbia albida and the palm Hyphaene thebaica coexist with planted date palms Phoenix dactylifera. Severe droughts and high aridity have made the intermountain zone of the Aïr a particularly harsh place for plants to develop. The additional presence of domestic herbivores has led to a severe deficit in tree regeneration, which has been cited as a major ecological concern. Tree regeneration has been observed enhanced as soon as tree seedlings are protected by large tussocks of the frequent grass Panicum turgidum. This positive interaction between plants represents a promising restoration tool to be used by local inhabitants. In comparison, mountainous areas are even less documented. Tropical tree species less resistant to drought have been described in the highlands, among which the Fabaceae Acacia laeta and Acacia seyal. Quezel  has observed the remnant presence of a rare endemic taxon related to the olive tree in the northern sector of the Aïr range. Recently, this taxon, Olea europaea subsp. laperrinei, has been found in other mountains of the Aïr: these very isolated, small populations represent the southern limit of the species distribution. A study led on the slopes of the highest summit in the Aïr, Idoukal’N’Taghes (2022 m a.s.l. ), identified plant species that had never been inventoried in Niger before. Among them, Pachycymbium decaisneanum, Cleome aculeata, Echinops mildbraedii and Indigofera nummularia are tropical species with relatively low resistance to water stress, whereas Silene lynesii, Tephrosia elegans, and Echinops mildbraedii have a Saharan-Mediterranean distribution. Three ferns were found for the first time in the Aïr recently, Cheilanthes coriacea, Actiniopteris radiata, and Ophioglossum polyphyllum, suggesting that ferns may be more prone to develop in arid environments than commonly proposed. All these data evidence a marked mountain climatic specificity in the Aïr, with a positive impact on species richness and species diversity. Because of their strong geographic isolation within a Saharan matrix, these species have a high conservation value. The town of Agadez in the heart of the Tuareg country is the capital of Aïr. Much of the Tuareg population of Aïr until recently led a nomadic life, relying essentially on camel and goats from which they take milk, meat and skins used in the production of local handicrafts. Most sedentary populations were either dependents of higher caste Tuareg pastoralists or the Ikelan ( Bouzou in Hausa / Bella in Songhai), former slaves and captives of the Tuareg from Hausa and other southern peoples. These peoples were settled in northern oases, to tend the date palm plantations held by the noble clans. Agriculture products from oases such as Timia, Aouderas and Tabelot are traditionally exchanged against clothes, or salt, brought by camel caravans (Azalai) from the remote Tenere oases of Bilma and Fachi to the east. Map of the southern Aïr Mountains. The Aïr is known for its rock art, dating from 6000 BC to around AD 1000. During the Neolithic Subpluvial the region was a pastoral area, as is illustrated by images of cattle and large mammals. During the 3rd millennium BC, however, a process of desertification began and the Tuareg from further north migrated into the region. Later art indicated war, depicting horses and chariots. In particular, a five-meter-high carving of a giraffe at Dabous discovered in 1999 is internationally famous. Cave art in the region is predominantly stone carving, initially with sharp rock, and from around 1200 BC perhaps with metal. When the Tuareg tribes were pushed south by Arab invaders in the eighth and ninth centuries, there were Gobirwa Hausa in the southern Aïr. Successive Tuareg Tels have controlled the area since at least the twelfth century. Agadez, as well as In-Gall to the east, were the farthest outposts of the Songhai Empire in the early 15th century. In the sixteenth century the area fell under the newly created Tuareg Sultanate of Aïr, and remained so until the arrival of the French at the end of the 19th. The emergence of the French weakened the Tuareg Kels and provoked both infighting and resistance to colonialism. From the 1880s, Toubu raids increased, and when the Tuareg Ag Mohammed Wau Teguidda Kaocen rose against the French in 1917, many towns were destroyed on his way to the siege of Agadez. When the French retook Agadez, a brutal punitive expedition through the Aïr left many formerly populous places abandoned, razed by Kaosen and the French successively. While the Kel Owey continued to dominate the settled oasis towns and pastoral herding, the sedentary farmers (Tuareg, Hausa, or Songhai) expanded farming and sedentary livestock cultivation in the mid-20th century. The famines of the 1970s and 1980s brought an end to this expansion, and as Agadez and Arlit grew, the towns of the Aïr have shrunk. The Tuareg Rebellion of the 1990s saw brutal government reprisals which depopulated many villages in the Aïr. Peace from the mid-1990s, as well as the uranium mines of Arlit brought unprecedented growth to the region, with many small towns gaining valuable tourism revenue. In 2004, a locust invasion ravaged many gardens, bringing scarcity and contributing to the Second Tuareg Rebellion (beginning in 2007) which continues to plague the region, effectively ending the nascent tourist industry. ^ The diaresis over the i notes that it should be pronounced separately and not together with the a. Occasionally also spelled without it as Air or the Air of Niger. ^ Thorp, M. B. (1969). "Some aspects of the geomorphology of the Air Mountains, southern Sahara". Transactions of the Institute of British Geographers. 47 (47): 25–46. doi:10.2307/621733. JSTOR 621733. ^ Shaw, Thurstan; Sinclair, Paul; Andah, Bassey; Okpoko, Alex (1995). The Archaeology of Africa: Food, Metals and Towns. Routledge. ISBN 0-415-11585-X. ^ [rst.gsfc.nasa.gov/Sect17/Sect17_3.html Use of Remote Sensing in Basic Science Studies], Section 17, NASA/Primary Author: Nicholas M. Short, Sr. (Site last updated: June 18, 2007). ^ "Mont Bagzane, Niger". Peakbagger.com. : incorrectly calls peak Mont Bagzane. Name of the peak is "Idoukal-n-Taghès", part of the plateau named "Bagzane". Also note, official and international sources believed Mont Greboun to be the highest peak as late as 2001. ^ "Mont Greboun, Niger". Peakbagger.com. .
^ Paul D. Lowman Jr. VolcanoWorld: Air, Niger Archived August 14, 2009, at the Wayback Machine. North Dakota and Oregon Space Grant Consortia, administered by the Department of Geosciences at Oregon State University. ^ URANIUM GEOLOGY: NIGER, WEST AFRICA Archived March 5, 2009, at the Wayback Machine, NWT Uranium Corp.
^ Ozenda, P., 2004. Flore du Sahara, third ed. CNRS, Paris. ^ Aubréville, A (1938). "La forêt coloniale – les forêts de l'Afrique occidentale française". Ann. Acad. Sci. Coloniales. 9: 1–244. ^ Anthelme, F.; Michalet, R. (2009). "Grass-to-tree facilitation in an arid grazed environment (Aïr Mountains, Sahara)". Basic and Applied Ecology. 10 (5): 437–446. doi:10.1016/j.baae.2008.10.008. ^ Anthelme, F.; Abdoulkader, A.; Viane, R. (2011). "Are ferns in arid environments underestimated? Contribution from the Saharan Mountains". Journal of Arid Environments. 75 (6): 516–523. doi:10.1016/j.jaridenv.2011.01.009. ^ Trust for African Rock Art. ROCK ART OF SAHARA AND NORTH AFRICA:THEMATIC STUDY. David COULSON. Sub-Zone 3: Niger (June 2007). Mortimore, Michael J. (1972). "The Changing Resources of Sedentary Communities in Air, Southern Sahara". Geographical Review. 62 (1): 71–91. doi:10.2307/214060. JSTOR 214060. Decalo, James (1979). Historical Dictionary of Niger. Metuchen, New Jersey and London: Scarecrow Press. ISBN 0-8108-1229-0. Fuglestad, Finn (1983). A History of Niger: 1850–1960. Cambridge University Press. ISBN 0-521-25268-7. Uranium Geology: NIGER, WEST AFRICA, NWT Uranium Corp. Includes technical summation of the geology of the Air Massif and surrounding region.